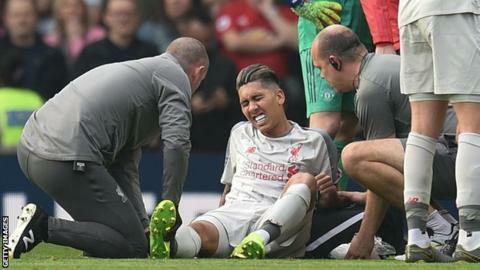 Roberto Firmino's ankle injury is not as serious as first feared and he has a "big chance" to return for Sunday's Merseyside derby against Everton, says Liverpool boss Jurgen Klopp. The Brazil forward, 27, left Old Trafford on crutches following Sunday's goalless draw with Manchester United. "If Bobby goes down and leaves the pitch it is always a bad sign because he is a pretty hard boy," said Klopp. "It will be very close for [Watford], but he has a big chance for the derby. "Writing Bobby off is a big mistake because he recovers pretty quick. I would say 'yes [there is a chance for Watford]', but I don't know if I would use that chance." Klopp says his side must focus on facing seventh-placed Watford before turning their attention to Sunday's derby at Goodison Park. "I don't think at any time in the history of football a manager thinks about a Sunday game when they're playing on Wednesday. Watford is a difficult one, they are on a good run and they have different styles of play," said the German. "Against the top six they don't have a lot of possession but they are a good counter-attacking threat, good from set-pieces and second balls. "It's different when they play other teams, they are much more proactive. We need to be ready for both."